PARKING: Entrance Baxter State Park currently requires a $14.00 day use fee (for out of state guests) which can be paid at a main entrance gatehouse. A limited amount of cars are allowed in each parking area and it is recommended to arrive very early to ensure you are "on the list". From the Togue Pond gatehouse follow the Park Tote road northwest past Abol campground, past Katahdin Stream campground continuing 6 miles to Slide Dam picnic area. The Marston trailhead has parking for 10-15 cars on the right. The Marston trail starts off gradually but soon becomes steep climbing almost 1000 feet during the first mile segment. The grade lessens and after a total of 1.3 miles merges with the Mt. Coe trail junction. 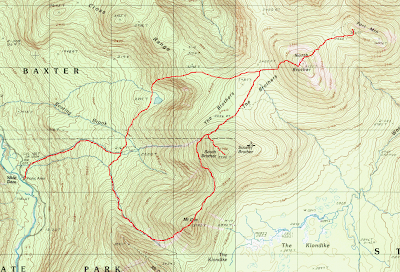 I planned to hike a loop counter clockwise climbing the steep and precarious Mt. Coe slide early in the day while my muscles were still fresh and descend the loop directly from the Marston Trail. At the trail junction bear right on the Mt. Coe slide trail. After 0.2 miles the base of the slide is reached and views of the shoulder along Mt. Coe begin. The trail climbs moderately before turning north and heading directly up the granite slab face of the slide. The slide is extremely steep however with every step in elevation the spectacular views of surrounding mountains including OJI and Doubletop only got better and better. The trail typically follows the left edge of the slide allowing supporting hand holds in the krumholz. Nearing the top, the trail precariously crosses the slide and continues along the right perimeter and enters the scrub fir trees. From here it's approximately 0.3 miles to the 3764 foot Mt. Coe summit where you are rewarded panoramic views of the surrounding mountains. The western flank of Mt. Katahdin can be seen to the east, Doubletop mountain and it's 3 slides aptly named the seahorse, the cat and witch is to your south. The ridgeline showing your destination of South Brother and North Brother lies ahead. The Mt. Coe trail condition deteriorates during the 1.1 mile traverse to the South Brother spur trail. The spruce are heavily overgrown making the trail seem more like a Maine herd-path. Follow the South Brother spur 0.3 miles as it makes a short ascent exiting the fir trees to the beautifully open summit of 3970 foot South Brother Mountain. A large boulder sits on the summit and the 360 degree views of the highest point in Main, Mt. Katahdin are absolutely breathtaking. I could have stayed here for hours however two peaks and several miles of hiking await. Return the 0.3 miles to the Mt Coe trail and continue north 0.7 miles over polar opposite trail conditions than the 1.1 miles from Mt. Coe. This section of the trail had little elevation gain or loss and provided great footing over a wide path to the junction with the Marston trail. Continue north following the heavily eroded Marston trail. The Marston trail seems to follow a riverbed making footing rough and insecure for this steep 0.8 mile pitch to the top of North Brother. North Brother is another spectacular summit with panoramic views that I could absorb for hours. Fort Mountain is a short 1 mile bushwhack. Look for a series of small cairns descending to the left of the North Brother summit sign (facing the sign). The cairns descend into overgrown spruce trees however the herd path can be easily followed by watching the worn foot path transcending the ridge. The herd path exits the trees and ascends the northwestern side of Fort Mountain. Fort Mountain appears to have 3 bumps which could be the summit. The peak to the right (east) is marked at 3856 feet and mapped at 10 feet lower than the northwestern 2 bumps. I visited both left (northwestern) bumps and the right peak seems to be a few feet higher than it's nearby counterpart. Fort Mountain also has amazing views of the cliffs and the Northwest basin of Mt. Katahdin but the most interesting aspect is the wreckage from a plane crash strewn about at various locations along the Fort Mountain ridge. Return via herd path to North Brother and descend the Marston trail 0.8 miles to The Mt. Coe trail junction and another 3.7 miles to parking at Slide Dam. Baxter State park is a unique and fascinating place that I recommend using a long weekend to explore the over 200,000 acres of wilderness. It contains several picnic areas, almost a dozen campgrounds, the highest mountains in Maine and arguably the best hiking experience in New England. I've wanted to complete this ridge traverse for several years and was glad to have the opportunity to experience this trek with perfect weather conditions. The cool temperatures and bluebird skies provided optimal conditions for this 13 mile hike. 4151 foot North Brother is the highest peak on the ridge and 6th highest in Maine. South Brother, Coe and Fort mountains elevation put all three of them on the AMC list of 100 highest peaks in New England. Doubletop Mountain and slides named seahorse, cat and witches hat. Mt. Katahdin from the South Brother summit.